Shown as a 12″ cake with vanilla buttercream frosting with dark chocolate ganache flood & drip. Cost includes gold pearl candy accents, chocolate sprinkle border & fresh strawberries with gold glitter topper added for additional charge. This design is available to order in limited sizes & flavors , for next day pick up. 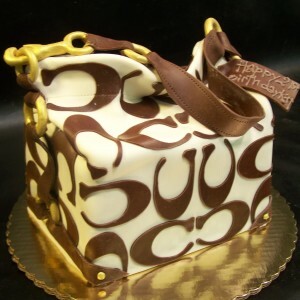 This design is perfect for that special person’s birthday, an engagement, bridal shower or special anniversary! 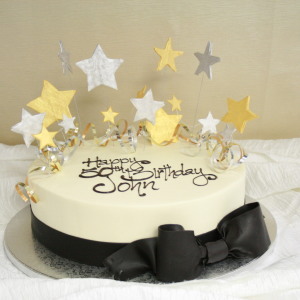 Price includes customers’ choice color buttercream frosting, with gold or silver sugar sequins fully covering the top, & trickling down the edge . A single statement magnolia blossom with hand painted details or full airbrush color flower sits on top, along with paper number toppers. 10″ cake shown with light pink buttercream frosting, & pink edged flower, & 2 number paper toppers. Limited flavors available with 48 hour’s notice. This two-tier cake features a rolled chocolate statement peony on top, with ombre bunting ruffle on the bottom tier. Pricing includes vanilla buttercream on the top tier with customer’s choice of one color rolled chocolate flower, and one color that will fade to white for the ombre bunting ruffle. Shown as a 14″& 8″ with a light lilac peony and light pink ombre bunting ruffle. This design requires a minimum of 2 week’s notice for the rolled chocolate flower. 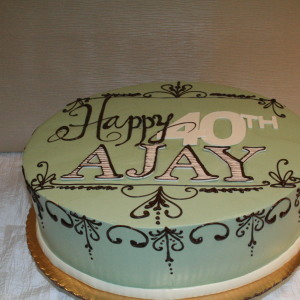 Includes customer’s choice frosting color with white RC applique number and ganache detail. Color shown is custom light blue-green. 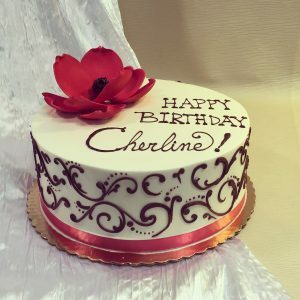 Design works best keeping the inscription short; no “birthday” also short names work best, 6 letters or less for most cakes, on cakes 8″ or larger. This design requires a minimum of 4 days. Design level D.
Celebrate a milestone with this cake featuring hand-made rolled chocolate numbers with swirls & dots design work. 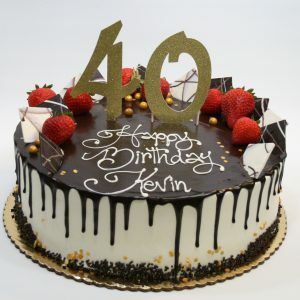 Includes customer’s choice of: 1 color for swirl design work, 1 color for the propped two-digit number and standard decor options for the top including tiny white stars (pastel buttercream flowers, fresh or chocolate dipped strawberries and chocolate adornments). 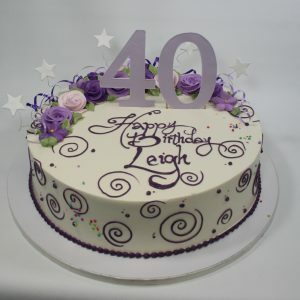 Shown as a 14″ frosted in vanilla buttercream with light lavender rolled chocolate 40, purple design work, and shades of lavender buttercream flowers. Limited sizes & flavors with minimum of 4 days. Design features customer’s choice of (1) color buttercream frosting with a white rolled white chocolate bow tie, straps & tag. 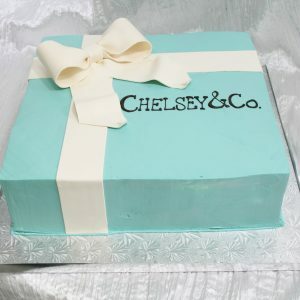 Shown as a Tiffany Box. This cake features hand-made rolled chocolate curly stripes with matching shooting stars. Pricing includes customer’s choice of color buttercream & curly stripes with matching shooting stars. 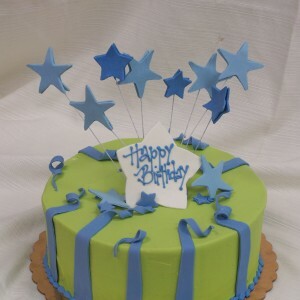 Shown as an 8″ round with lime green frosting and royal blue stripes & stars. This design is available in all flavors & sizes with a minimum of four day’s notice. Design Level E.
Includes vanilla Italian or American buttercream frosting, black rolled chocolate banding & bow tie, with metallic gold and silver shooting stars. Shown as a 14″ cake item # 5936 This design requires a minimum of 4 day’s notice. Design Level G.
This design features a hand-made rolled chocolate guitar. Pricing includes customer’s choice of (1) color for the body of the guitar on either vanilla or chocolate buttercream. 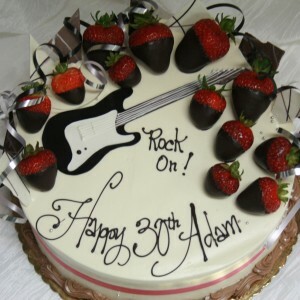 Shown as a 10″cake with a black guitar on vanilla buttercream and chocolate dipped strawberries. This design is available in all flavors with 7 day’s notice. 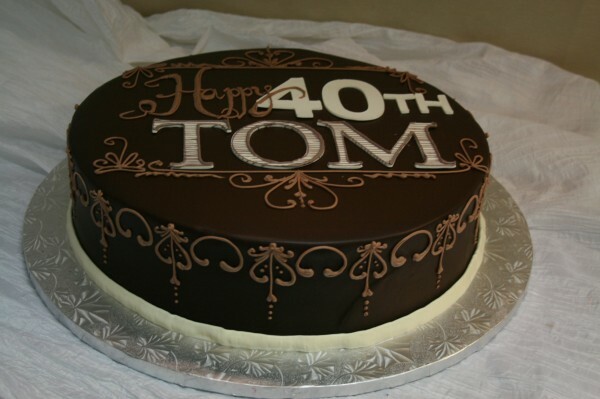 We Recommend this design be done on an 10″ sized cake or larger. This colorful cake includes 1 color design work with a ring of pastel buttercream roses & pansies. Shown as a 12″ round frosted in vanilla buttercream with pink Monet design work and mixed pastel buttercream roses and pansies . Available in all flavors and sizes with a minimum of 4 day’s notice. Limited flavor selection available with 48 hour’s notice. 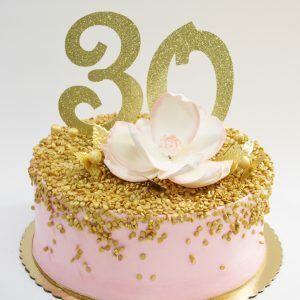 This cake includes ganache scrolling lace design work on the cake side with a statement magnolia flower on top, with coordinated ribbon border. Pricing includes customer’s choice 1 color flower & ribbon, with ganache OR 1 customer’s choice color scrolling lace design. 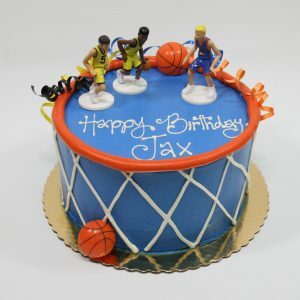 Shown as a 8″ round frosted in our vanilla buttercream. Limited sizes and flavors available with 72 hour’s notice. 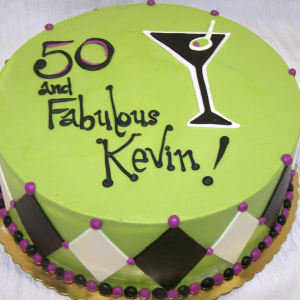 Cake design as shown features light lime green color buttercream frosting, black & white Rolled chocolate applique harlequin & martini glass detail, with accenting raspberry color dot detail (recommended on 8″or larger cake size). Price includes customer’s choice color frosting & accenting dot color with black & white RC Applique. This design requires at least 4 days notice. 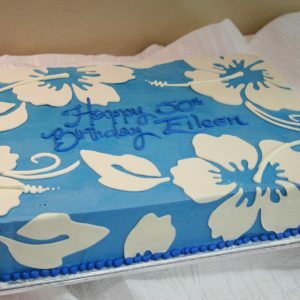 Design Level E.
Includes customer’s choice color frosting with white rolled chocolate hibiscus print. Shown as a 1/2 sheet cake with light royal blue buttercream. This design requires at least 4 day’s notice. Design Level F.
This sunset beach scene features buttercream palm trees, white chocolate sea shells and buttercream flowers. 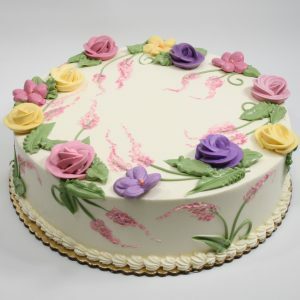 Includes customer’s choice of pastel color buttercream flowers. 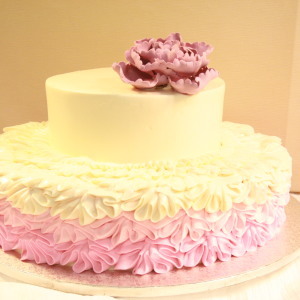 Shown as a 10″ round cake with shades of pink flowers. For a full selection of sizes & flavors, we require at least 4 day’s notice. Limited sizes and flavors available with 24 hour’s notice. Scene B. 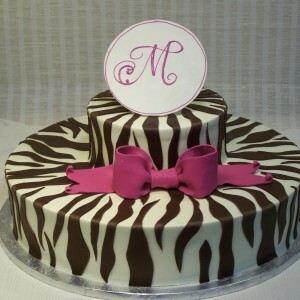 Includes 2 tiers frosted in vanilla buttercream with BLACK Zebra stripes on both tiers. Over sized propped disc on top & customers choice of (1) color RC bow. Shown as a 16″+8″ with hot pink rolled chocolate bow. This design is available in all flavors and sizes with a minimum of 4 day’s notice. Design Level D (x2) +Tiering. A great pick for any Red Sox fan! 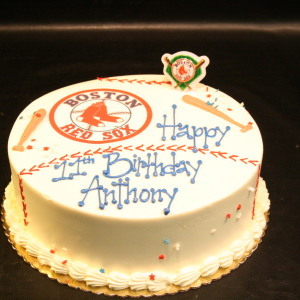 This baseball cake features buttercream baseball bats and a Red Sox logo on top. Shown as an 8″ round. Full selection of flavors and sizes available with 4 day’s notice. Limited flavor and size availability with 24 hour’s notice. Scene B.